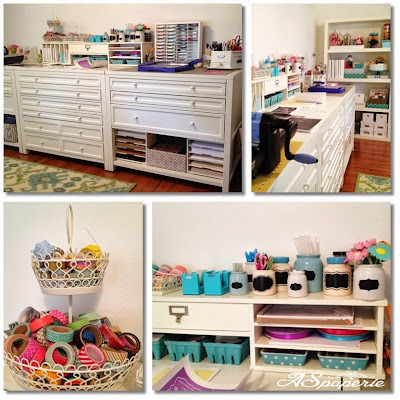 Hello to all my fellow craft storage enthusiast!! Hazel here and today we are visiting Ali Edwards. I’m SURE you all know who she is but for those wondering – she is a designer, blogger, author, and mother of two. She has written four books about scrapbooking, authored a popular monthly column for Creating Keepsakes magazine, conducted workshops around the country, internationally, and online, and currently designs digital scrapbooking products for Designer Digitals and stamps for Technique Tuesday. Now for Ali’s room. She says that her goal is to make stuff and that she doesn’t want to spend a lot of time organizing. For her stash she wants a selection but not excess. Sound like a good idea to me. The two Varde tables from Ikea are back to back. They are the perfect height as Ali likes to work standing up. The tops are nice and big which means that some supplies can go on top and the rest goes in drawers or in baskets below. Along both walls are Ikea Expedit shelves on wheels. These are awesome on their own but having them on wheels makes them that much more awesome. I just love the pull-out Kvissle Letter Trays from Ikea. They are used to store the current kits. Best part is, you can pull the whole tray out and move it to the work table and the move it back when done. OK. This is my favorite!! Inside the doors of this locker you’ll find inks, paints, ribbons, sewing supplies, etc. Most of these things Ali doesn’t use every time she makes something. Out of sight but still on hand. On the opposite side of the room from the lockers, right next to the windows, are the computer desks. I love the sunshine pouring through the windows and the “interactiveness” of working together. That’s it from me. I hope you have enjoyed Ali’s studio with me. Please hop over to her blog to read the rest and while there, leave some comments to let her know that we appreciate her sharing with us. Have fun and craft on. Clean up your desk using recycled items. Hello to all my fellow craft storage enthusiasts. Once again, Hazel all the way from down under Sunny South Africa. Ever once in a while we get an assignment “choose a topic”and I’ve decided that mine will be reuse, recycle and repurpose ………………. FOREVER!!! In South Africa households don’t formally recycle (YES, we don’t!!!!!) so for the past 10 years I’ve been PAYING someone to pick up my recycling and he has a group of unemployed workers who sort and get paid for my unwanted stuff. About 5 years ago someone said to me: “when it all this going to stop? I thought you would have given up long ago”. And I said: ” NEVER”. It is my duty and privilege to recycle because I want to leave the world a better place. My whole family joined in the fun. It’s worth your while to see how my boys party – HUGE containers for recycling everywhere because they know, if anything ends up in the garbage, I’ll have them sort the lot. I totally hate an untidy desk, so I thought I’d see what Blogland has to offer to clean up your workspace using recycled goods. Ready, let’s GO! And who doesn’t like jars? What about desk bags? Recycle some left over pieces of fabric or repurpose an old garment. I use this idea all the time and it triples up your desk space if all the unneeded items can be stored within reach but not on your counter top. Here you can see my system. Use the pockets from all your fave denim garments. The post shows you how. I think it would be a great addition to a hallway – to keep your keys, glasses and cell phone out of sight but on hand. Watch out denim ……………………………. I’m collecting pockets!!! What about tissue holders? Not only for your stationary but also for storing cables! I love to repurpose an old item. Especially a wooden piece. If I can get my hands on this one ………………………………… LOVE it! And just think about it – you can add 5 more storeys to your desk. OK and now my wild card ……………………….. an old telephone directory! That’s it!!! My gift to you and mother earth ………………………. recycle, reuse and repurpose those unwanted items to make everyday life a bit easier. I hope you have enjoyed my tour around Blogland. Please leave some comments – I love to hear and see what you do. Until next time. Have fun storing your crafts! 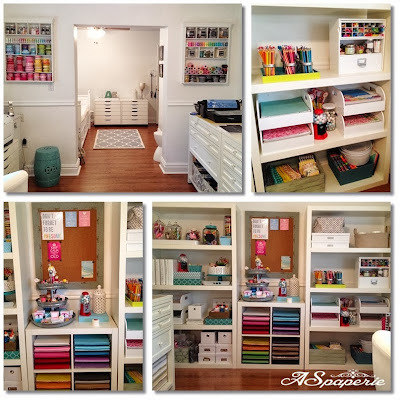 Author Hazel HammanPosted on March 20, 2014 March 23, 2014 Categories Storage Solution Roundups!Tags craft storage, DIY craft storage, DIY Storage Idea, drawers12 Comments on Clean up your desk using recycled items. Hey there CSI crafty friends! Lisa here today to introduce you to Jodi of Pleasant Home and give you a sneak peek of her creative space. Jodi is a quilt pattern designer and quilter who has been blogging since 2006. I enjoyed exploring her blog and Pinterest boards, so many beautiful quilts and fabrics!! Next to decorative paper I might be tempted to hoard fabric. I just love to look at it! Jodi’s husband built the cabinets specially designed for this room. I like the set of tabletop drawers and the clear glass canisters she uses to organize this work surface. Isn’t the trio of paper lanterns cute! Love this playful fabric used to dress the ironing board and the darling robin’s egg blue stool! The other half of the ironing board surface holds her cutting mat. There are more handy shelves and storage cubbies here as well. Jodi framed buttons and trinkets she has collected over time. A clever idea to organize them as well as keep them clean and damage free! Her space started out with a different fabric and color scheme, but has since been change to this that she calls “more me”. Stop by to say hello, there are more photos and information about this cute creative space on Jodi’s blog Pleasant Home. Thanks for spending some time with us today!